The fight against poverty is certainly the biggest challenge facing humanity this century. With 40% of the world population at poverty level and a fifth in a situation so extreme it threatens their own survival, a world free of shortcomings and fears, as sought the Universal Declaration of Human Rights is still a distant aspiration. However, governments around the world have expressed their desire to eradicate poverty. At the 2005 World Summit world leaders reiterated their determination to meet the Millennium Development Goals (MDGs), including the eradication of poverty and hunger. The challenge now is how to translate these commitments into action. Historically it has been molded by Western worldview that defines the degree of civilization of a country according to its economic development. Thus, the “no development” and poverty came to be translated into a mere statistical per capita income. Under this perspective it can be said that culture has prevailed on all the political economic, social and cultural thinking that the market meet the needs of individuals efficiently. However, he soon found that economic development should not necessarily lead to an equitable distribution of the wealth generated, and more, this development is not always relied on sustainability. During the 80 Nobel laureate in economics Amartya Sen, made a new development paradigm represents the expansion of freedom for people to express their abilities and potential. Expanding freedom is because the primary purpose and once the primary means for development. Sen’s ideas were assimilated by studying new trends developing in all its breadth, seeping between the United Nations system and the United Nations Program for Development (UNDP). Finally, sometimes overlapping with the prospect of Sen, there is a third approach to the concept of development, understood as the realization of human rights in its fullness. If these are the highest expression of human freedom, the degree of its acquisition involves varying development. These three views provide different views of human development but also complementary. The first approach focuses on the field of satisfaction of needs in this regard the eye focuses on what we lack, favoring approaches and strategies purely on assistance. The newness that introduces the prospect of capabilities Sen, is based precisely where the accent is not in what we lack (needs), but the potential to be or do (skills). Based on the freedoms also tries to eliminate the barriers that cause people not eligible for life that they would like to wear. Finally, the vision of human rights provides a different shade scoring threshold development in which all people should have access. This nuance is very important because it requires the whole of society the effort needed to make it a reality. Possessing a legitimate right for people to be able to claim it. From these three perspectives can also redefine the concept of poverty. Poverty represents therefore only a matter of income, but mostly a matter of being able to live a life with dignity, enjoying human rights and freedoms that come from them. The link between health, poverty and development has been interpreted in different ways over time and by different actors. In 1978, the International Conference on Primary Health Care WHO meeting in Alma Ata, said that the economic and social development based on a new international economic order was of fundamental importance to achieve a maximum degree of health for all and to reduce inequalities in health between developing countries and developed countries. At the same time, said that the promotion and protection of health is essential to sustained economic and social development. Thus, poverty is the cause of ill health, and ill health, in turn, increases poverty. To achieve a level of health that allows lead a socially and economically productive, the Alma Ata Declaration recommended to implement the strategy of primary health care. This Statement establishes strong links between health and development and considers access to health as a social goal of extreme importance, whose realization requires the action of many social and economic sectors, not just health (agriculture, education , housing, communications, industry …) and, especially, the full participation of all individuals and families in the community in the planning and implementation of health care. Over the past decades, but have not been taken into account in these holistic approach in planning development policies. The cuts in basic services, including health care, have involved a deterioration in the quality of life and good health of the population, particularly the vulnerable. In 2000, WHO established the Commission on Macroeconomics and Health (CMS) with the aim of placing health within the overall economic development. The summary of the first report, led by Jeffrey Sachs determined that an improvement in the health of people living in poverty is not only an objective to achieve by itself, but acts more as a strong catalyst for economic development and the reduction of poverty in society. This means that the individual good is common. In addition, establishing a series of relationships between investment in health and economic development capacity. For example, the loss in economic terms representing HIV in Africa is 12% of the GDP of the continent; economic development in countries free of malaria is at least 1% higher than those in which malaria is endemic. So health plays an important role for itself in both the theory of human development as the focus of human rights. But the effects of health on the economy and the effects of poverty on health, are very important. For example, malaria is the second cause of death in sub-Saharan Africa. This disease damages the family economy and the local community, it affects the workforce, reduce efficiency at work, reduce land use and load the family budget with the costs of prevention and treatment . Malaria is also the major cause of school absenteeism and are expected to reduce the learning capacity of 35% to 60% in the school. 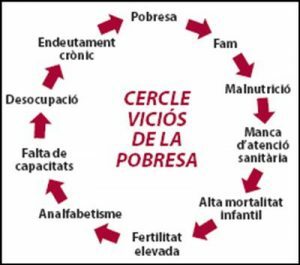 Poor people are the most affected as they have less access to health services, information and prevention and treatment. Finally, malaria reduces international trade and the development of sectors such as tourism. In the figure below are shown some of the associations mentioned in the case of malaria, but are extended for any disease. Usually collected connections between basic human needs and the lack of capacities, rights and freedoms of people can degenerate into poverty. At the same time, it shows how poverty causes needs diminishes the capabilities and limits freedoms and rights. As contained in the report on health in the WHO African region in 2006, the challenges are enormous for governments and the strengthening of health systems and health policies achieved only through regional cooperation and international cooperation.